There are many ways programs can try to get your attention in Mac OS X. They can place a small badge on their Dock icon; (annoyingly) bounce that Dock icon; make noise in the background; or even do all of those things at once. But I'm not a fan of any of these approaches. Instead, I prefer Growl, a free (and open source) third-party notification manager for OS X. That description is a mouthful, but basically, Growl watches other programs so you don’t have to. I briefly covered Growl’s features in this Macworld video and Derik DeLong wrote about an older version of Growl back in 2005, but this is our first official review. Growl runs as an "invisible" background process. When programs that support Growl—developers must add this support themselves—want your attention, they tell the Growl process, and Growl then presents that program’s message on your screen, using one of a multitude of message styles, an example of which can be seen at left (click it for a full-size version of the alert). Growlified: Apps automatically appear in this list if they include Growl support. 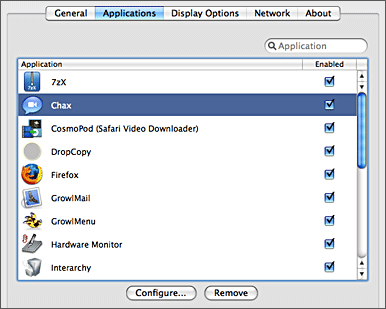 Once you install Growl, you configure it in a new Growl pane of System Preferences. The interface features several screens that control what Growl does and how it does it. The General tab lets you add a Growl menu-bar icon, specify whether to leave notifications onscreen if you’re not reacting to them, choose the default location for Growl notifications, and hide all notifications (useful if you want to leave Growl running, but not see its alerts). The Applications screen contains the meat of Growl's settings. Here you see a list of all programs installed on your machine that include Growl support. (As soon as you install and launch a program that includes Growl support, it appears in the list automatically; you don’t have to do anything.) You can temporarily disable Growl for a particular program by unchecking the box next to it; you can disable support for that program for good by highlighting it and clicking on Remove. Growled iChat: Chax can use Growl to notify you of all sorts of iChat events. 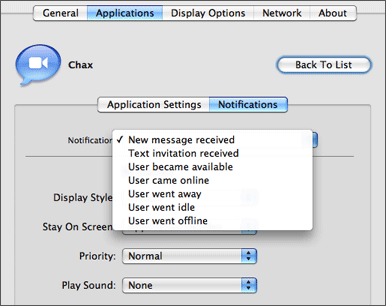 “But iChat has its own built-in notification system for those events and many more,” you might say. Yes, it does…but if you use iChat’s system, you’ll have to use one of its notification methods, which include bouncing dock icons, sounds, speech, or running an AppleScript. With Growl, you can instead see a nicely-formatted, floating text box containing the notification. These alerts automatically vanish from the screen after a certain amount of time (unless you elect to have them remain onscreen until you dismiss them). You can even choose for different events to have different notification styles, each with or without sound, or even disable alerts for particular events. Customized notifications: When a user logs in, Growl displays a very low priority message, never leaves it on the screen, and doesn't make any sounds. When new message is received, the priority is set to normal, the message can stay on the screen, and a sound is played. Display styles are handled in Growl's Display Options screen. You control the default style for all messages, as well as elements of each notification style. 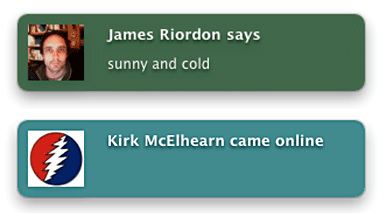 There are many built-in display styles to choose from, including a couple that don’t actually display anything at all: The MailMe display style, for instance, will send you an e-mail instead of displaying a notification, and the Speech style will—surprise!—speak the notification instead of displaying it. If the supplied styles are too limiting, the developers provide additional styles for download, and a bit of work with Google finds other sites with available styles. One of my favorites is iPhonesque, which emulates the iPhone’s elegant pop-up messages. Between the application-specific settings and the customization possible, you can really make Growl look and act exactly how you want: every message can have the same appearance; messages can be the same within an application but vary between programs; or you can go crazy and create unique alerts for every single notification. As much as I like Growl, it’s got a few issues. First, the project isn’t exactly being updated at a rapid pace: The current version (1.1.4) was released in June 2008 and it’s got a few bugs in it. For example, I noticed a display glitch in the Display Styles tab, wherein the Preview button would display the preview for a different style than the one I was actually working with; specifically, the previous one in the styles list. And network notifications, which allow notifications to be sent to networked machines—useful, for example, for monitoring the status of a large download happening on a different Mac—work only part of the time. Finally, the user interface is a bit complicated to figure out, as there are so many options. Reading the documentation helps a bit, but that information is out of date and the screenshots no longer match what you see when you run the program. Despite these problems, I still find Growl’s notification service to be quite useful, and it’s hard to complain too much about a free program that works as well as this one does.